This wonderful nature reserve, between Tregaron and Pontrhydfendigaid in Southwest Wales, covers an area of some 2,000 acres. The site comprises three raised bogs built up from deep layers of peat that have taken around 12,000 years to form. It is a wild landscape made accessible by a network of boardwalks that enable visitors to get right into the heart of varied habitats and to enjoy seeing the wildlife at close quarters. Running in and around the reserve is the River Teifi, which is designated as an SAC in its own right because it supports interesting species of fish, otters and aquatic plants. This NNR is managed by Natural Resources Wales (NRW). Cors Caron is situated directly off the B4343 Lampeter to Aberystwyth road between Tregaron and Pontrhydfendigaid. Look out for its new car park, which is clearly signed and located on the western side of the road (on your left if travelling from Tregaron). 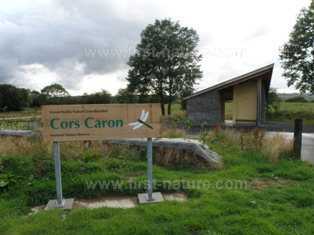 Cors Caron is one of our most accessible nature reserves. From the car park there is level access into the reserve and the many paths that run in and around it. 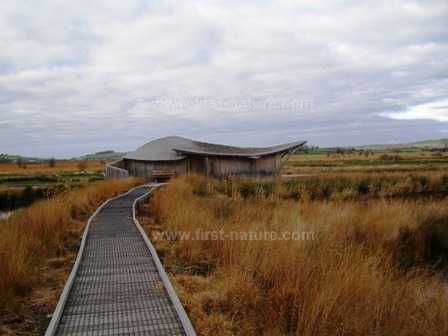 A boardwalk runs through the reserve for some 3.5km (2 miles) in total and is suitable for wheelchair users and people with prams or pushchairs. There is also a bird hide adjacent to and easily accessible from the boardwalk, and there are plenty of places to sit and rest, watch the wildlife or contemplate the beautiful scenery. There are public toilets at the reserve, while pubs, cafés and shops can be found in the nearby village of Tregaron. 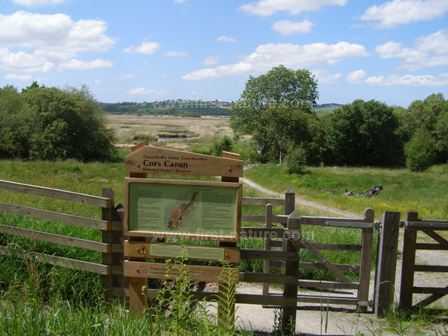 Cors Caron NNR is close to Teifi Pools, which is the source of the river. The vast area of raised bog is responsible for the river's somewhat back-to-front flow. Most rivers rise in hills and immediately plunge down precipitous landscape before entering gentle lower reaches; but the Teifi is different. Not far below its source the river meets the calming influence of Cors Caron, resulting in a long stretch of gentle, slow-flowing water with deep pools adding considerably to the wild beauty of the nature reserve. It is in its lower reaches that the Teifi plunges through a sequence of rocky gorges before emerging into the sea at Cardigan Bay. The convex structure of Cors Caron that we see today is very different from how it looked 12,000 years ago. There is evidence of a woodland phase during the habitat transitions and large chunks of Bog Oak, one of which has been dated as being 5,000 years old, have been recovered there. In other stages parts of the area would have appeared either as a flat, boggy landscapes or as a water-filled depressions left after the retreat of glaciers that formed during the last ice age. Gradually, the area of standing water progressed through stages as a marsh and then a valley bog as the plants there - bog mosses in particular - turned into layers of silt and peat that eventually formed the raised dome that characterises the landscape now. In 1992 the immensely important habitat features at Cors Caron - the raised bog and mire -were recognised as a wetland site of international importance under the RAMSAR Convention. This is truly a nature reserve for all seasons, particularly if your interest in is wild birds. The beginning of autumn heralds the arrival of passage migrants and various species of widlfowl that overwinter on the lakes and the river. The visitors are likely to include Snipe, a handful of Greenshanks (Tringa nebularia) and Green Sandpipers (Tringa ochropus), Wood Sandpipers (Tringa glareola), Whooper Swans (Cygnus cygnus), Wigeon and Tufted Duck. Cors Caron is also an important winter feeding site for Red Kites (Milvus milvus) and Hen Harriers (Circus cyaneus). Other raptors seen there during the year include Buzzards (Buteo buteo), Merlins (Falco columbarius), Sparrowhawks (Accipiter nisus), Hobbies (Falco subbuteo) and Goshawks (Accipiter gentilis). Although often thought of as a winter birding site a main feature which qualifies the NNR as a SSSI is the damp grassland breeding birds. Of the 170 or so bird species that have been recorded at Cors Caron, more than 40 breed there. Water Rails (Rallus aquaticus), Common Teal (Anas crecca), Mallard (Anas platyrhyncos), Snipe (Gallinago gallinago), Curlew (Numenius arquata), Redstarts (Phoenicurus phoenicurus) and Meadow Pipits (Anthus spinoletta) along with many others raise their families in this wildlife haven. Cors Caron is also one of the few places where we have heard cuckoos (Cuculus canorus) during early summer in recent years. This NNR is not just about birds, though, and if plants are your main interest there is plenty to see here. Some of the water plants include Bog Asphodel (Narthecium ossifragum), Purple-loosestrife (Lythrum salicaria), Bogbean (Menyanthes trifoliata) and Marsh Cinquefoil (Comosum palustre). There are also plenty of Heath Spotted-orchids (Dactylorhiza maculata) flowering there in the summer. Sundew (Drosera rotundifolia), a carnivorous plant, finds a ready supply of food in the myriads of small insects that live in bogs. Its leaves are covered with hairs topped with sticky droplets that trap the insects when they land on the plant. Over the course of a few days the leaves enclose the insect and it is dissolved into a substance that can be easily absorbed by the plant. 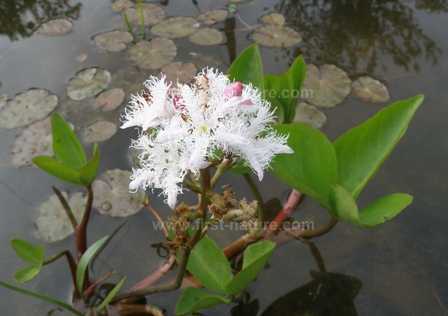 Below: Bogbean - a plant so much more beautiful than its name! Other interesting plants at Cors Caron include Deer Grass (Trichophorum cespitosum), Purple Moor Grass (Molinia caerulea), Reed Canary Grass (Phalaris arundinacea), Soft Rush (Juncus effusus), Heather (Calluna vulgaris), Bog-rosemary (Andromeda polifolia), White Beak-sedge (Rhynchospora alba) and, of course, mosses including many types of sphagnum moss, two of which - Sphagnum magellanicum and Sphagnum pulchrum are notable. In high summer Cors Caron buzzes with insects, and in particular, dragonflies. Sixteen dragonfly species have been recorded there. This site is also the most southerly limit for the Large Heath Butterfly (Coenonympha tullia), whose caterpillars are dependent on the distribution of a food plant that grows only on acid peat. Fortunately, Cors Caron has this plant: White Beak-sedge. Another rarity found here is the Rosy Marsh Moth (Eugraphe subrosea). This insect was thought to have become extinct in Britain more than 100 years ago, but recently it has been found in Wales at Cors Caron and Cors Fochno, and it has also been spotted in Cumbria in recent times. Although very little research on spiders has been carried out in this area, Cors Caron is a very good place to see them. So far more than 90 species have been recorded on the Reserve. An interesting one to look out for here is the Jumping Spider (Heliophanus dampfi), which lives only in raised bogs; this particular spider has also been seen at Cors Fochno, in the Dyfi NNR. Otters (Lutra lutra) roam the waterways at Cors Caron, and they are one of the reasons for the designation of the reserve. 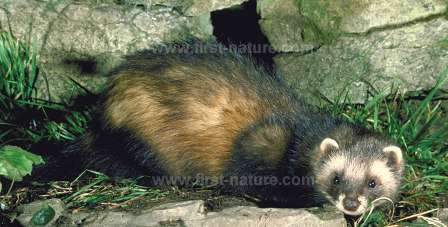 Other mammals that live there include Polecats (Mustela putorius), Harvest Mice (Micromys minutus) and Water Voles (Arvicola terrestris). The Harvest Mouse has not been recorded for some years, and in Cors Caron would build its nest among Molinia and Reed Canary Grass rather than true reeds which are curiously absent from this NNR. This endearing little creature lives up to its scientific name micromys and is only about 11.5cm in length half of which is taken up by its prehensile tail. The Harvest Mouse builds two nests: a round structure slung between two stalks of reed or other suitable plants, and to sleep in, it builds another nest of dried grass on the ground. Whatever time of year you choose to visit Tregaron Bog there is always something interesting to see and enjoy. In winter it is a quiet peaceful place, but in spring and summer it is completely transformed by the burgeoning plantlife, the buzzing of insects and glorious birdsong.